So, I realized something today. Recently, I’ve been really slacking in the, we’ll call it, “personal upkeep” area. Now, that’s not to say, I’m looking like a scumbag, showing up to work dressed like a bum, but I don’t really remember when the last time I put on make-up to go to work was. Jewelry? Ha! Matching clothes are accessories enough. I’ve never been a high maintenance girl. I’ve always thought those girls who get up 2 hours early so their hair can be perfect and they can cake on their make-up are absolutely ridiculous. At the same time though, I feel much more “pulled together” when my hair is done and I’ve got a bit of make-up on. I’m wondering if my recent slacking isn’t partially to blame for my blah moods. I’m just not feeling/ looking as good as I could. So, in an attempt to improve my moods, I’m challenging myself to pull it together for the next week. What does this mean? Basic make-up every day, at least one accessory, and no ponytails. I’m not going to give myself anymore time to get ready; I just need to manage my time in the morning more efficiently. In some ways, I feel like I’m contradicting myself by doing this. After all, don’t I believe that inner beauty is what matters most? It is, but I think sometimes having the outter reflect the inner is important too I suppose. Anyway, moving on the the important stuff…dinner! In honor of National Pancake Day, I made brinner tonight! (I love brinner!) 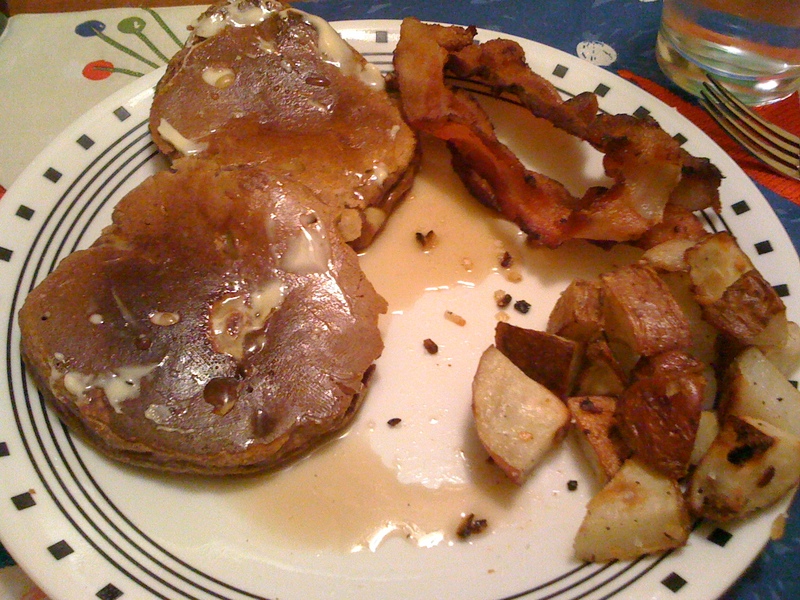 On tonight’s menu: cinnamon banana pancakes, Trader Joe’s uncured bacon, and some roasted red potatoes. I may have snuck back for an additional pancake, or two, later. Just sayin’. My friend Nicky came over for dinner last night. After we ate, I colored her hair and we watch Man v. Food. That show is one that both intrigues me and disgusts me. I think it would be awesome to have a job where you travel the countryand eat at all these different places! It’s a foodies dream really. However, the show highligts America’s gluttony at it’s finest. NO ONE needs to drink a 6lb milkshake! I thought I was goig to vomit just watching the host consume this thing! Anyway, time for bed! See you in the morning for breakfast! I go through phases where I wear makeup and do my hair every single day and then I go through phases where I roll out of bed and show up to work with my hair in a wet pony tail and a blank face. And I’m not just talking about a one week phase here.. I go months or YEARS in one phase and then one day, slip back into the other for more months/years. One of my “2010 goals” was to take better care of my skin. This actually means for me that I NEED to wear make-up! If I wear make-up, especially mascara, I know that I have to wash it off or my eyes will itch and my eyelashes will start falling out. If I just go au natural all day, then I don’t feel inclined to wash my face. Also my foundation and powder has acne fighting medicine in it, so wearing make-up makes me break out less. Since making that goal, I’ve worn make-up every single day (Okay I’ve skipped a few weekends where I wasn’t going out or doing anything exciting)! I also have been doing my hair and have only missed one or two days. I notice that if I don’t do my hair, I just feel gross all day. I’m less likely to want to work out that afternoon and I’m less likely to care about what I’m eating. I have no idea HOW just doing my hair and wearing make-up does this, but there is definitely a correlation! It’s not about being beautiful on the outside, to me. It’s more about being confident and knowing that I look the best I can (especially lately when I’m sleeping so much less than I used to). My routine is super simple and it actually only takes about 15-20 more minutes in the morning for me to pull myself together and it makes me feel so much better all day! Definitely worth it!